If you’re playing fantasy racing for the Sprint All-Star Race, you need help. I can’t blame you for watching it or getting into it because it is a great way to cheer on your favorite driver—assuming he’s in the race—without worrying about whether or not you’re going to fall asleep in the middle of the race. Of course, with the way that the All-Star Race has a tendency to run late, you may be wanting to fall asleep at the end of the race, especially if you’ve been drinking. This is the second year that the All-Star Race has been extended to 100 laps. The 100 laps will be broken up into four segments, the first consisting of 50 laps, the next two of 20 laps, and a final 10 lap dash for the cash. There will be a 10 minute break between segments three and four to make adjustments, but track position is going to be key at the end of segment three. No set of legal adjustments are going to let a driver go to the front from the back in 10 laps, unless half of the field gets taken out in a crash, which is a higher than likely possibility when considering past history at this race. Handicapping this race is a crapshoot. Nine different drivers have won the last 10 editions of the All-Star Race, and the only repeat winner in that time frame is Jimmie Johnson. (I bet you never would have guessed that). Even the wins are spread around amongst the teams, as six different teams have won in those 10 races, but—strange to some—Joe Gibbs Racing has never won an All-Star Race. With Kyle Busch, you have to imagine that streak will end sometime soon. 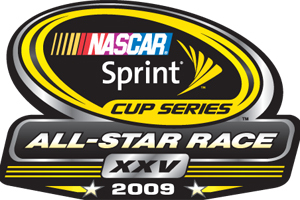 Open Race winners have held their own in the All Star Race, but besides Brian Vickers’s third place finish in 2005, haven’t really been competitive in the main event. AJ Allmendinger won last year’s Open, but finished 17th, and something tells me that Scott Speed won’t make it back to back Open wins for Team Red Bull Saturday night. Martin Truex Jr. and Scott Riggs each finished 10th in 2007 and 2006 respectively, and Sterling Marlin finished 18th due to an accident in 2004.
Who do I like in this race? I have no clue. I could make compelling cases for a lot of drivers, but I have a feeling that a car with Hendrick equipment is going to win. (No, not Dale Earnhardt, Jr.) The odds on favorite has to be Jimmie Johnson, followed closely by Jeff Gordon, but I think that a Stewart-Haas driver is going to take it, especially with the way that they’ve been picking up steam lately. I’ll go ahead and say that Ryan Newman wins his second All Star Race as Gene Haas watches on for the first time since getting released from prison.